Cable Lugs and Links Malaysia (Complying to Local MS and International IEC Standards i.e. MS 1540:2002, MS 1779:2002, and MS 2584:2014), Insulated and Non-Insulated Terminals (UL Standard) - LEONG HING ELECTRICAL ENGINEERING SDN. BHD. Leong Hing Letrik Kajang having established for more than 38 years has been supplying the industry with high quality cable and wire connectors and accessories that are type-tested to meet local and International Standards. We have a huge range of insulated / non-insulated terminals, cable lugs and cable links.The Insulated/Non-insulated terminals that we supply comply to the UL Standard. 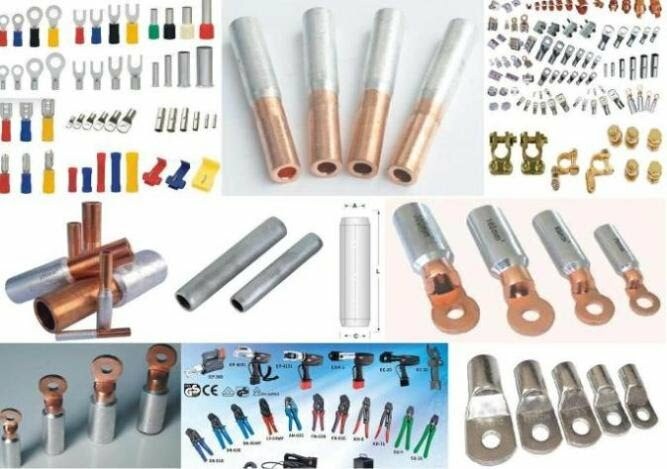 We have cable lugs, bimetal lugs, cable links, bimetal links, aluminium ferrules (aluminium links), and other insulated and non-insulated connectors. Our local manufacturer is one of the most established terminals manufacturers with ISO 9001:2008 certification. Our cable lugs come with the cable inspection hole and complies to the MS 1540:2002 (low voltage cable lugs), MS 1779:2002 (low voltage cable links), and MS 2584:2014 (bi-metal lugs).For cable lugs and cable links, we have the full range of this including bi-metal lugs and links, and aluminium ferrules and links. The aluminium circular conductors/ferrules that we carry are pre-filled with compound jointing, plugged, and individually labelled. Currently there are many type of cable connectors imported into Malaysia, some of which are either not suitable to Malaysian cables, or may be inferior in quality. This may result in high temperature (energy loss) at the connections, or even burning the connectors. The only way to prevent this is to use a standard. With this in mind, the Malaysian Standard was developed and obtained during year 2002, MS1540 for Cable Lug and later MS1779 for Cable Link in year 2005. In order to avoid unnecessary problem, the Malaysian Standard should be specified during the purchase cable lugs or cable links. Engineers and planners have the responsibility to specify cable lugs or links that comply with the Malaysian Standards. Users too, should insist on buying the right cable lugs and links so that the connection will be at an optimum temperature, resulting in safety and energy-saving on the connections. At Leong Hing, our cable links and lugs comply to these standards. Therefore, with our years of experience and technological know-how, you can continue to be assured of quality products that you buy from us. Crimp type Copper Cable Lugs for use with compact conductors in single and multi core power cable in Low Voltage applications – Specification for the Material, Marking and Dimensions. Crimp type copper Cable Links for use with compact copper conductors in single and multi core power cable in Low Voltage applications – Specification for the Material, Marking and Dimensions. Crimp type copper aluminium Bi-metal lugs for use with XLPE insulated and compact aluminium conductors in single and multi core power cable applications up to 36 kV - Specification for the material, marking, dimensions and type test.